​The Royalty program is designed to provide an opportunity for area youth between the ages of 9 and 25 to learn about the sport of rodeo and promote the Rooftop Rodeo while developing their communication skills. Girls and boys involved in the program work behind the scenes and promote the rodeo in Estes Park during rodeo week. In addition, they participate in the rodeo parade and opening ceremonies at the fairground arena each evening during the rodeo. For more information on the royalty program contact the royalty coordinator, Megan, at royalty@rooftoprodeo.com . 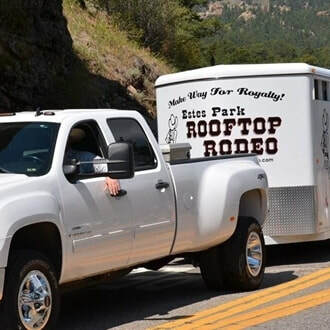 The Rooftop Rodeo Queen and Attendants love to travel to other Rodeos, Fairs and Parades. They are also available to speak at clubs or organizations. If you would like to invite them to your event we would be happy to hear from you. Please email Megan at royalty@rooftoprodeo.com Events currently attended by our Royalty include the Mountain States Rodeo Finals, Estes Park Catch the Glow Parade, National Western Stock Show and Rodeo, Miss Rodeo Colorado clinic, Elizabeth Stampede, Greeley Independence Stampede, Cheyenne Frontier Days, Larimer County Fair and Rodeo, Evergreen Rodeo, and Douglas County Fair and Rodeo.